Used car marketplace Truebil, started by former employees of Housing.com, plans to expand services to eight more cities with an eye on facilitating daily sale of about 60 cars on its platform by the current-year end. The Mumbai-based company, which is run by Paix Technology Pvt Ltd, presently sells four cars everyday through the virtual marketplace where it inspects used cars, prepares inspection reports and uploads photographs of dents/scratches, said Shubh Bansal, Truebil's co-founder. "The used car market is growing at compounded annual growth rate of 25 per cent and this is expected to double in the next five years. A car is no longer treated as a luxurious item, but a commodity. We believe these factors coupled with Truebil's business model will take us to these targets easily," said Bansal. Today, the startup has a 50-member team which claims to have facilitated sale of 225 cars. Since inception four months ago, the company has recorded GMV of about Rs 4.5 crore. It claims to be growing at 35 per cent week-on-week in terms of supply (listing on the platform) and cars sold, said Bansal. Everyday 35-40 new cars are getting listed. Bansal said that his team has inspected over 1500 car so far. "We call ourselves as a 'transactional managed marketplace' and not a classified platform because while most of our competitors operate as marketplaces for dealers, we are a marketplace for cars. We focus on C2C because in such a model, the buyers and sellers get the value," Bansal said. In many ways, Bansal and team are replicating the business model of their previous employer Housing.com in the used car space. Just like Housing puts out quality pictures of the houses so that the buyer can decide whether to visit the property or not, Truebil posts about 45 images (including pictures of dents and scratches) for every car listed on its platform. Moreover, all cars on the Truebil marketplace come with a pre-inspection report and warranty. So, when a seller requests to list his car on the platform, an expert first inspects the vehicle and this report is shared with a potential buyer. Truebil has also launched two features, namely 'Quick Sell' and 'Book Now', which it claims to be major differentiators. 'Book Now' is a facility through which prospective buyers can pay Rs 1000 and block a car for purchase. The car will remain blocked for about three days, before which the buyer needs to confirm the purchase, said Bansal. Presently, the 'Book Now' feature is the only revenue generator for this startup. Bansal said the company will soon start charging seven per cent of the car's total value for every transaction. 'Quick Sell,'gives a 15-day guarantee to sellers. If the car is not sold in that time-frame, the company will buy the car. Bansal said the company now gets about five requests per day for this feature. The advantage of Truebil's peer-to-peer model is that it eliminates middlemen. Car dealers generally take up to 10 per cent as commission on a used car transaction. Truebil was founded in March 2015 by five former Housing.com employees namely Suraj Kalwani (IIT K), Ravi Chirania (IIT KGP), Shubh Bansal (IIIT Jabalpur), Rakesh Raman (IITB), and Shanu Vivek (IITB) along with former Fab.com executive Ritesh Pandey (IIIT Jabalpur) and ex-Rio Tinto official Himanshu Singhal (IIT KGP). The pre-owned car market in India is worth $10 billion. However, 85 per cent of all pre-owned cars sold are sold through unorganised channels. It's estimated that about seven million used cars will be sold per year over the next 10 years in India. 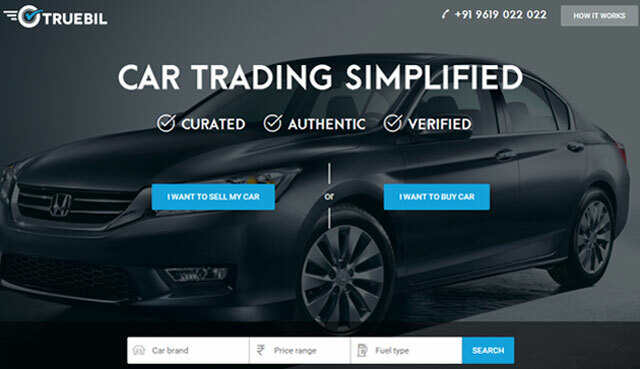 In the online space, Truebil competes with players such as Zoomo, CarDekho (which acquired Gaadi.com), Carwale and CarTrade in addition to horizontal P2P platforms such as OLX and Quikr. Truebil had raised $500,000 (RS 3.17 crore) in its first round of funding from seed stage VC fund Kae Capital and angel investor Anupam Mittal in June this year. A significant portion of the money is being utilised to develop a technology platform and the rest is being spent on team expansion. Truebil is also developing a mobile app which will be launched by end of this month. The firm hopes to raise $7-10 million in the next couple of months for further expansion plans.